During June of this year, there was an effort on the part of the US Fish and Wildlife Service to procure water for summer Delta outflow for Delta smelt. Now the State has announced a similar plan. The summer standards for outflow in this Below Normal water year are a monthly average of 6500 cfs in July, 4000 cfs in August, and 3000 cfs in September. These outflows and the variability inherent in the monthly average standard are not protective of Delta smelt. In a June post, I recommended 9000, 5000, and 4000 cfs, respectively, to protect remaining smelt after four years of drought conditions. No water has been procured, and Delta outflow so far in July has averaged 7000 cfs. The map below (Figure 1) shows the average location of X2, the location where salinity is approximately 2 parts per thousand (sea water is approximately 30 ppt) at various Delta outflows in cubic feet per second. X2 is the general location of the critical mixing zone of the estuary and the upper end of the Low Salinity Zone (1-6 ppt). The state Delta outflow standard for August is 4000 cfs, which should keep the daily average location of X2 west of Emmaton (EMM) and Jersey Pt (SJJ). This standard is required to protect Delta water quality, keep Delta smelt west of the influence of South Delta exports, and keep emigrating juvenile salmon moving west toward the Bay and Ocean. The standard applies in wetter year types including this year. In drier years, as in the past four years, the standard is 3000-3500 cfs. The need for the higher July outflow protection stems from the fact that the smelt gradually move westward into more brackish water over the summer. In July they tend to be upstream of X2 in a planktonic stage and vulnerable to being drawn into the central Delta. They are often located at the upper end of the Low Salinity Zone (500-1500 EC) which in July, at 6500 cfs outflow, is vulnerable to exports (see location of Threemile Slough TSL, Jersey Pt SJJ, and False River FAL in Figure 1). Figure 1. Location of X2 (2 parts per thousand salinity) in the Delta at various Delta outflows. 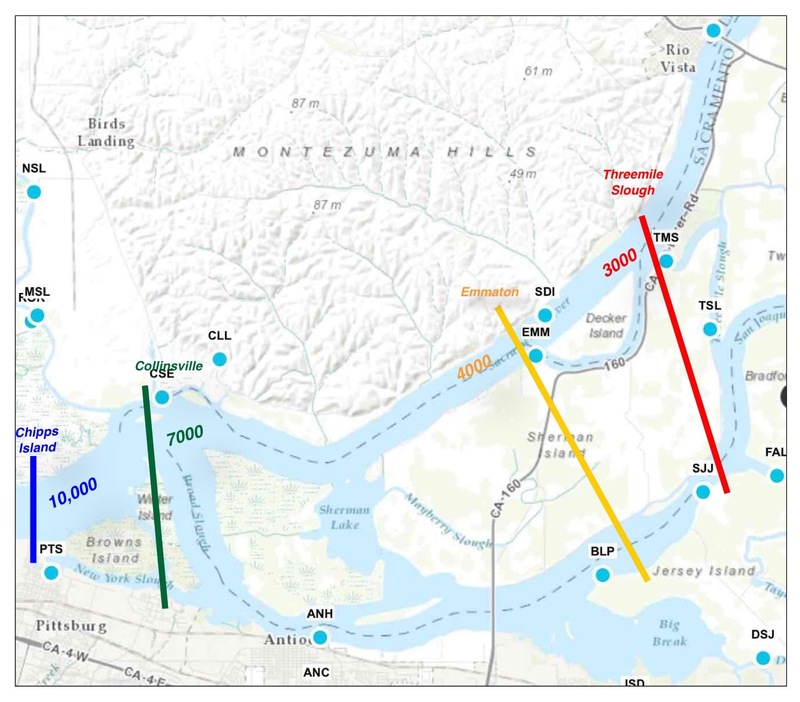 To protect Delta smelt in early summer (June and July), X2 and the Low Salinity Zone need to be located west of Emmaton and Jersey Point to ensure portions of the LSZ are not drawn into the central Delta from Jersey Point (via False River FAL) or Threemile Slough (TSL). In the following sections, graphs show clearly that such protections did not occur in drought years 2014 and 2015, and as yet not in 2016. 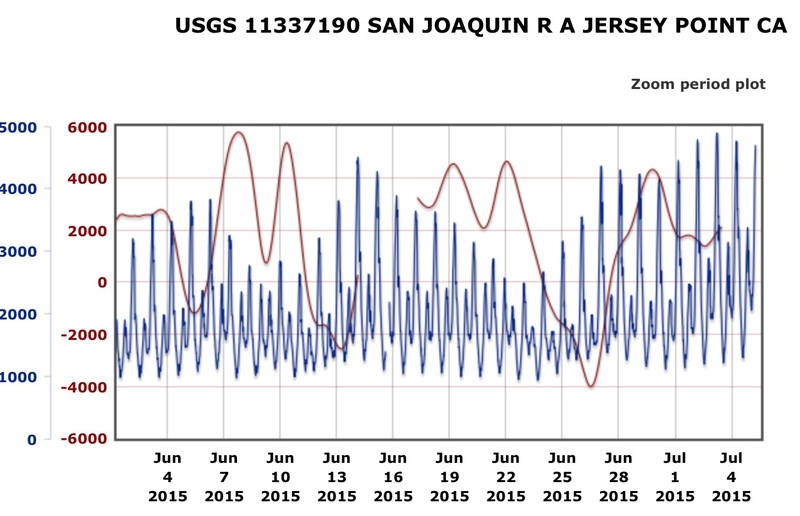 Keeping X2 below Jersey Point requires some daily, even hourly tuning of the Central Valley and Delta plumbing to compensate for tides. The next two charts (Figures 2 and 3) show that EC of 2000-4000 (X2 is about 2700 EC) reaches Jersey Point when tidally-filtered flow falls below zero during spring tides. The LSZ and X2 were at Jersey Point in early summer in both drought years. Figure 2. Salinity (EC) in blue and tidally filtered flows in red at Jersey Point in early summer 2015. Delta outflows were 3000-4000 cfs in this critically dry year. Figure 3. Salinity (EC) in blue and tidally filtered flows in red at Jersey Point in early summer 2014. Delta outflows were 3000-5000 cfs in this critically dry year. 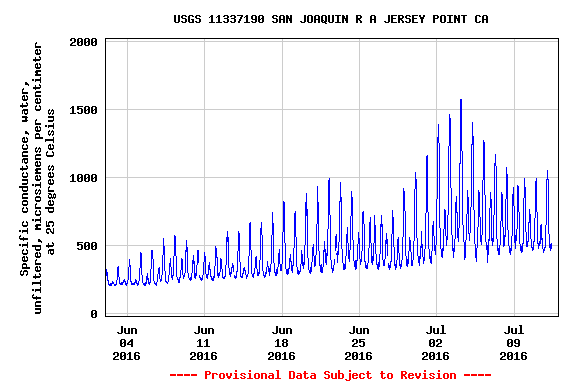 In 2016 to date, by contrast, with outflow about 7000 cfs in early summer, salinity at Jersey Point is lower (Figure 4), but the upper LSZ remains at Jersey Point. Increasingly high salinity is indicative of rising south Delta exports through the period, beginning near 3000 cfs in early June and reaching 8000 cfs in early July. 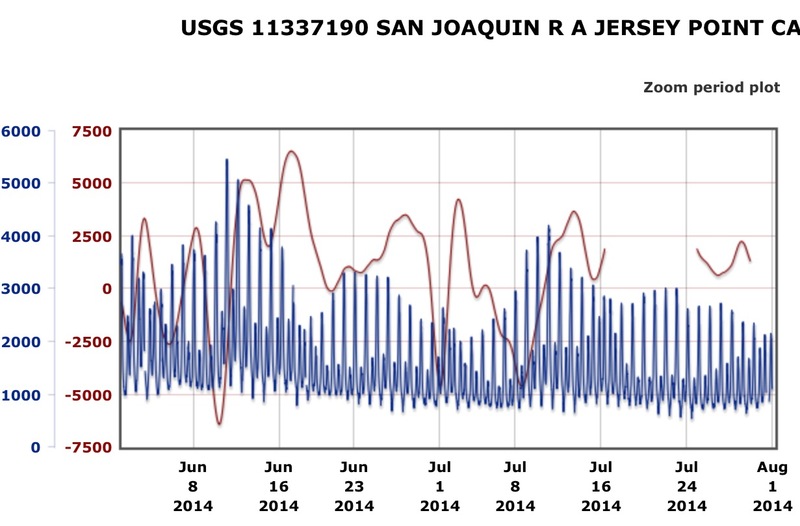 The tidally filtered flow at Jersey Point (Figure 5) gradually declined with increasing exports after mid-June. 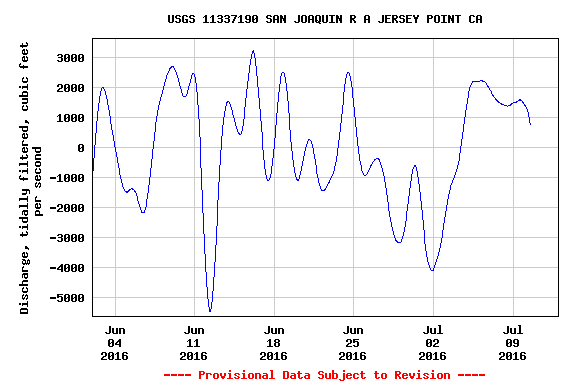 In short, my recommendation for 9000 cfs outflow in July, and rationale for the quest for more water by the USFWS, are simply to bring salinity at Jersey Point back where it was in early June: below 500 EC. This would keep X2 and the LSZ with its remaining Delta smelt downstream of Jersey Point and away from the net negative flows toward the export pumps. Also, the further west X2 and the LSZ are located, the cooler they will be, which also benefits the smelt. If it were up to me, I would set a standard that EC should not exceed 500 at Jersey Point in early summer. Figure 4. Salinity at Jersey Point in early summer 2016. X2 (EC 2700) has remained downstream. Figure 5. Tidally filtered flow at Jersey Point in early summer 2016. High negative flows are caused by South Delta exports during spring tides.